Season’s Greetings to all my dear readers and friends – I’ve been tardy again with posts. Way too busy making stuff and creating a gorgeous and extremely well organised art space and watching my garden grow to actually take any photos. Today our official photographer called round and was coerced invited to take some shots – so here is a small update to record progress on the various projects in action. Go no further if you are not a lover of BLUE! I painted the old ‘Create’ letters and re-hung them and made a new frock for my trusty old office chair. The only purchases were the gorgeous blue butterfly fabric – I splurged and bought two metres and then spent hours making it go as far as four metres would have – and the plain blue which was a dress fabric on sale. The rest is from my stash of fabrics, or old stuff made over. This is once again a makeover / revamp done on a minimal budget. Which is incredibly satisfying! The full view of the back wall where I hung an A3 copy of all the current completed work with the expectation of filling up that entire wall by the end of next year with examples of completed pieces – hopefully not just faces! 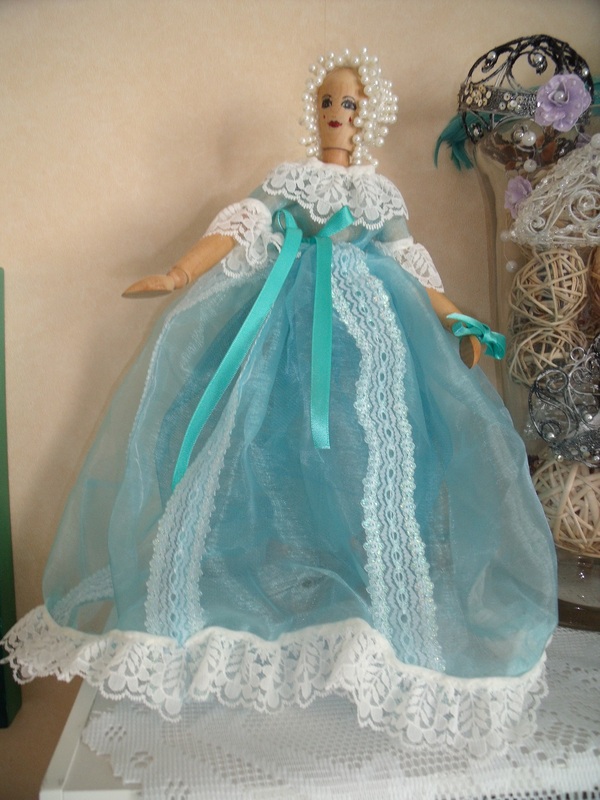 Totally inspired by the lovely Alys over at Gardening Nirvana who did this to her dressmakers model in honour of Christmas, I swept up some bits and bobs, beads and ribbon and did this to my mannikin who previously had spent all its days naked, standing atop this same shelf. Everything was hand sewn as I went along, as I had no idea what I was doing until I was doing it. My Indoor Sid made the move from the living room to the art room, just for a change of scenery. I’m currently crocheting a long vine of leaves to wind around those blue flowers I made for the front of the shelves. 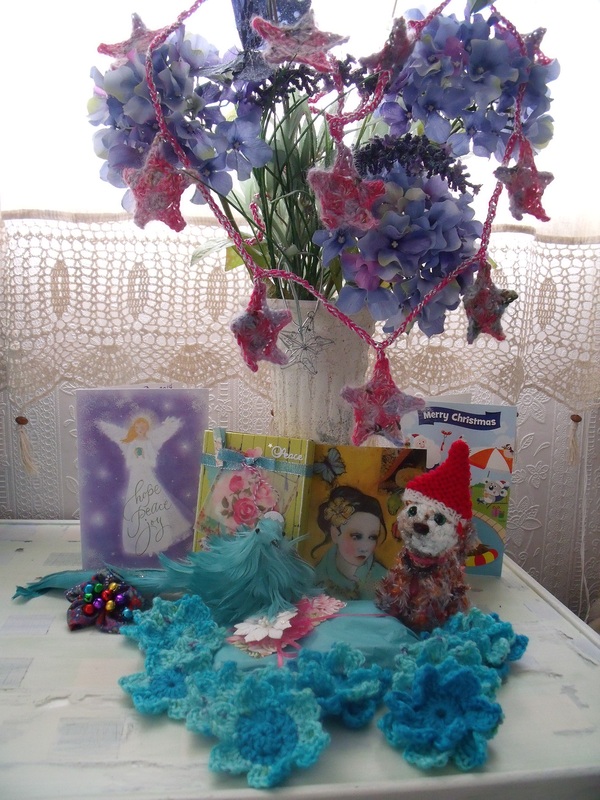 I made many more flowers too, they will hang in the window along with Claire’s stars when all is ready. Orlando and Siddy are both in good health. [I know you were wondering!] Siddy is in desperate need of yet another hair cut and may go under the scissors tomorrow. The boys have been receiving Christmas parcels from their blogging friends. There is a pretty aqua package from Boomdeeadda Orlando’s Mini-Me got a dinky Christmas Cap from Gentle Stitches and of course there is Siddy’s tinkly Christmas flower from Mollie and Claire. And just this morning the postie brought us all some bunting from Teddy and Tottie. [Sorry, that package arrived just a little too late to be included in the photo]. Top this all off with an unbelievably wonderful invite from three of our American friends which I’ll share later – and this is one highly blessed Contented Crafter and furry family! 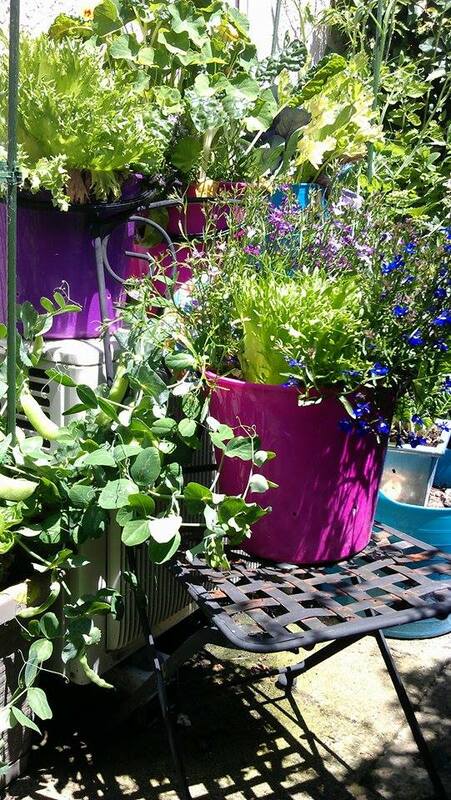 This entry was posted in Daily Life and tagged art room makeover, blue, blue room, budget makeover, Christmas is about the love, container gardening, gardening in a tiny space, love, yes you can grow peas in a small garden by thecontentedcrafter. Bookmark the permalink. I’ve been spending my holidays having a good clean up, sort out and throw away in my sewing room. It doesn’t look as pretty as yours and you’ve inspired me to work on that. I have a huge pile of crafty items that I no longer need or will never use and I’m going to have a garage sale so that someone else might find them useful. I will continue to work on the decluttering and hopefully I will have as gorgeous a workspace as you do – something to aim for! 🙂 I am so happy to have been some inspiration to you! De-cluttering is unbelievably good – it makes everything feel so much lighter! Good feng shui! I hope you will make yourself a gorgeous work-space, I have already found it has a knock on effect to my creations – plus you’ll want to spend time in there if it reflects who you are. That is the plan. I want to set up a dedicated writing space in there. Having my storage more organised is already great. It looks so tidy. Blue bunting from Hawaii – just fabulous. Fran will love it! I still haven’t made mine yet – it is the next project which is scheduled for a Monday start and finish I hope! We have had such an eventful time of it this year – you with your massive move and all the upset and trauma associated with such a thing. While I did an enormous internal shift and decided to be happy where I am. Writing that I just realised – the perennial gypsy came to a rest. Heavens to Murgatroyd, that is a turn-around! What a year! And 2015 is looking to be pretty full on too – I’m excited! I was telling a friend about your book the other week- I’m going to pass it on to her for her pre teen to read at the right time. It’s such a good story I wish it was still in print! Oh, Pauline! I was thinking you had a ‘creative room’ and a ‘growing room’, but the more I think about it, the more I feel that creating and growing both take place in both locations. (hope that’s not too weird a sentence). I can’t decide which delights me more . . . honestly, the now blue creative room, especially with the ID hanging there so beautifully, just makes one want to draw up a chair and begin on something . . . but then, on the other hand, the wee garden! Just what I love best; a profusion of live things growing away as fast as they can. I have to say I’d never prune around Mr. Sidd; I love the way he is sitting there, up to his neck in green and obviously contemplating something in a most focused way . . . and the cat! I really like the shape of the leaves just to the left (my left) of him; they look like some sort of fern or palm fronds. Your sweet peas, too; one thing I love about them is that they need to be cut so they will bloom even more. Ages ago, back in Victoria, BC, I was living with a young friend for a while. She had a pretend fireplace in her living room, with a mantel that was painted white to match the walls. The floor was varnished wood (it was a pre-War building and so just my sort of thing). I had been collecting small glass bottles of slightly varying sizes for some time. We filled them with water, then lined them up, spaced a little, along the mantel, And then I put a sprig of sweet peas in each bottle 9I was growing them out the back in the common area). Very simple and so, so sweet to see. They perfumed the room, too. I remember reading about how Helen Nearing (co-author with her husband Scott of “Living the Good Life, or How to Live Sanely and Simply in a Troubled World” and two other books) would grow three long double rows of sweet peas every year. On Saturday mornings before she went off to town for the weekly shopping, she would put five gallon buckets of water in the back of her pickup truck, then pick enough sweet peas to fill the buckets with bunches. As she drove through the town, she would stop and give a bunch to the people walking along. It was one of her hobbies and must have delighted so many for years. I’ve never forgotten about that. I hope you and the furry wonders have had a perfect Christmas and Boxing Day. I’m looking forward to seeing what comes out of the Create room once the garden slows down a bit. Linne, it was a delight to read your thoughtful response. Growing to the left of Sid’s cat is a self sown native fern – I’m unsure if it has come through a crack in the concrete or from the soil base of the raised bed. It is doing very well though and we are cheering it on! That small raised garden is just soil dumped on top of concrete which was sour and dead when I moved in. The only thing growing in it was oxalis which has been impossible to eradicate altogether, but which is being crowded out now by the sheer volume of plants. I absolutely love the term “the season for shinining our lights”. That whole last paragraph is just incredible. You have such a way with words! and of course with craft rooms and gardens and all kinds of things. You have been WORKING! I’m so very impressed with all you have accomplished, Pauline. Cheers!! Joy and peace to you. Thank you Laurie! I love my room and my garden – today the first sweet pea bloomed and that felt really special – especially as I had been warned they might not do well in such confined space. But it looks like they are about to let rip with the flowers – and mmmmmmmmmmm the scent is delicious! OH my -what a great post -where do I begin???? I love the BLUE it inspired me and it is a calming-creative color:-) Love all that you have done. I did get some of mine( messy creative space)cleared the other day but have been busy with starting seeds etc. I have “creative” goals, but just too busy with sorting through seeds and talking to people to find out what they want to plant in their space. I am growing some for people that would like to learn how to grow more-so I am busy starting for others. It makes me happy to give + you are so right- “Shine your light for yourself, for your loved ones, for those who are alone and in pain and who cannot, at the moment, see the light. Remember, it’s not about the stuff. It’s about the love” Totally the way I feel we need to be in this world today-it feels so good to give to others + not think of yourself all the time! I can understand why you have been busy with all that you have going on in that space! I LOVE LOVE LOVE what you have done with your outdoor space. 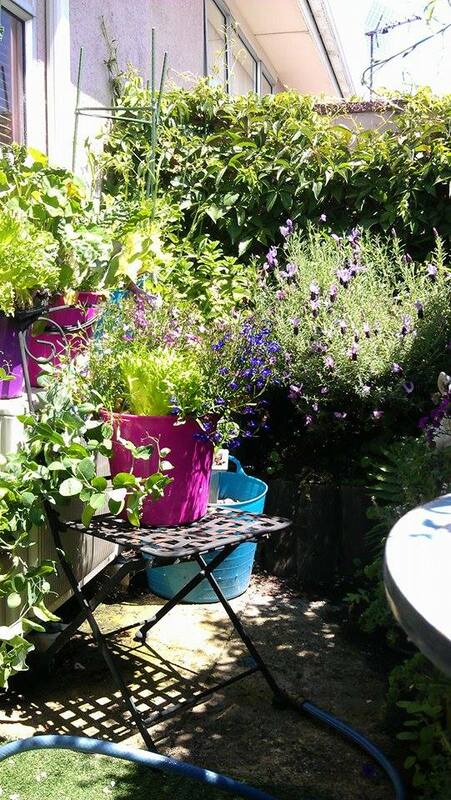 It is beautiful, productive and inspiring:-) I really love the purple+ pink growing pots-they just pop in the growing area. ALL that food, yum! You inspire me to think of using more PURPLE in my space! Look what you did with that space you thought was so bare last year—look at all the green + it looks HUGE! It is so wonderful that you help others start their gardens – that practical help is so good! Once folk plant a seedling and watch it grow they will be hooked – it’s that simple isn’t it. And having you to guide them in the organic route is just perfect for them. They are most fortunate new gardeners! 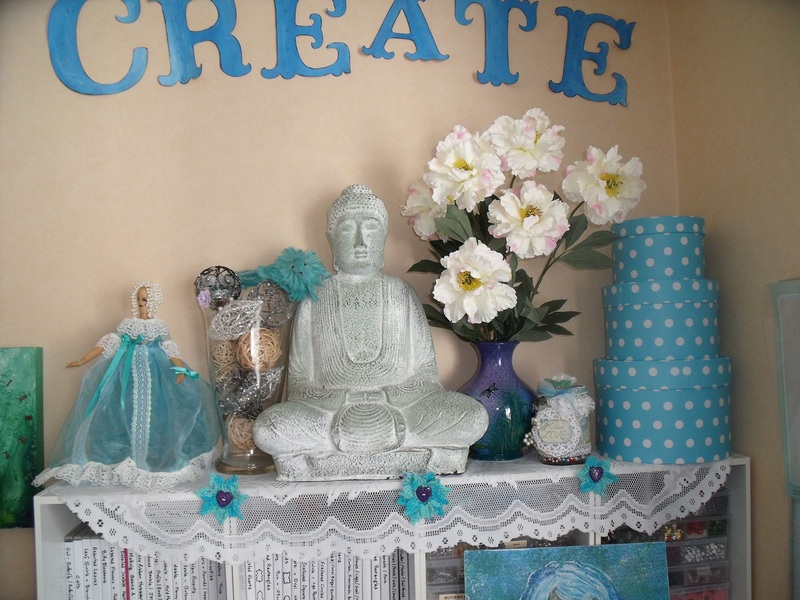 I love my blue art room Robbie – I’m totally besotted with it. We gave Siddy a haircut in there today as his Christmas treat [not!] and it was lovely to be using the space for something so practical. It just takes a “spark” to get a garden going:-) You are so right:-) Once they see the beauty it gives them inspiration to try it themselves + you are so right-it simply is not that hard to do, but I have to admit an artist in a garden is a beautiful combination. It is not mere rows but rivers of color! If purple is your creative colour Robbie you must use it – surround yourself with it and soak it up! I used to temper myself with colour, try to tone it down and be more neutral – and I never liked the spaces. Now I just go for it and my mantra is ‘If a little is good, more is better!’ I layer shades and hues and patterns and balance with whites and creams mixed together for depth. Your garden is like a well used artists palette with colour mingling and intermixing. 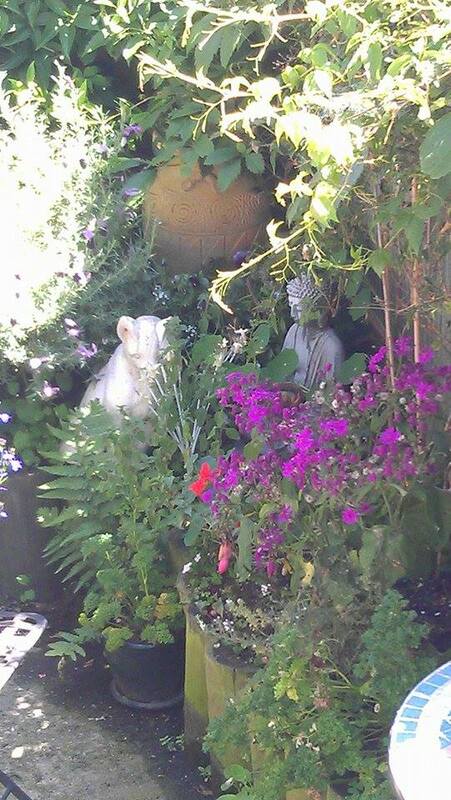 Your statuary is the neutrals, adding in shapes and forms to the abundance of growth and riot of colour. Your garden is an amazing living piece of art! It absolutely inspired me to try for something here. hmmmm…maybe I will do that this spring-paint myself in with color. Shoot- All I have to do if I move some day— is paint over it! :-) It is for me + I feel you have it right. I have been feeling a bit “blah”with the “safe” colors. It is just my husband and me, so why not! The garden inspires me but my “creative space” inside- just makes me want to go away! You have inspired me-AGAIN:-)I”ll keep you updated as to what I come up with! I am putting color in my veggies this summer-even more!!!!. I have searched for “blush” colored tomatoes that have mixed colors in them, more purple odd shaped, interesting vegetables, flowers + herbs for my edible garden for 2015! I watched a you-tube video of an artist that gardens now full-time and he said the dirt is his canvas + he creates upon IT!!! Well, you know mother earth is the ultimate artist and her creations surround us in their ever changing shapes and colours. We all just try our best to imitate her! I have always thought that creating a garden was an art form. Not the sterile rows of plants of the market gardener, nor the little neat modern annuals planted exactly 4″ apart with lots of neat grey soil around them of the timid home gardener – but the riot of colour and form found in a lush over-planted abundant garden when gardener and nature work hand in hand. Your garden is such a place and is a joy to look at through the lens of your camera. If you took that same flair and turned it on a room – wow!! Go for it!! Pauline, that is one amazing transformation and of course I love it because blue is my favorite color. I would wake each day and want to head straight for my art room if I had one that looked like yours. Your dangler looks like it was made just for that room. I think the dangler inspired me to make the leap with the colours Lois – I was a bit afraid it might be too much – but it isn’t. I stand in the doorway and smile. I can’t wait to get it completely finished and sorted and start using it. All good wishes to you and yours for Christmas and 2015 too. Pauline, thank you for shining your light on us, your friends in the blogging world. You are certainly an inspiration to me. Your Arty Crafty room is simply splendid. I love that you have done this make over with mostly stuff that you already have in your home. I love the blooming garden too. You’ve got quite a bit going on there. I’m glad to know at the boys are healthy and doing well. I wish you peace, joy, and good health this holiday season and always. I got my Mehendi last Thursday. It is fading, but still quite pretty. Ooh, your room looks amazing! I am loving the butterfly chair, it’s so pretty. I can sense you losing many an hour in that room over 2015 creating away. And your artwork on the wall – are they your own paintings?! Your garden looks lovely too, very colourful. It’s a far cry from the winter scenes over here with all our bare trees. Mr A and I planted lots of bulbs in Autumn though so we are looking forward to what comes up next year! Thanks Jem – yes they are prints of my mixed media paintings done over the last fourteen months. I thought it might be fun to use them as wallpaper 🙂 I love that butterfly fabric – it was a bit pricey but was too gorgeous to leave in the shop! I have a very tiny courtyard – its about 2 x 4 metres and almost everything edible is growing in tubs and buckets – I didn’t know how it would do and apparently it is doing quite well 🙂 It is quite exciting! Your paintings are beautiful, very ethereal. I am sure once you start your new course you will have enough to wallpaper the entire wall in no time! 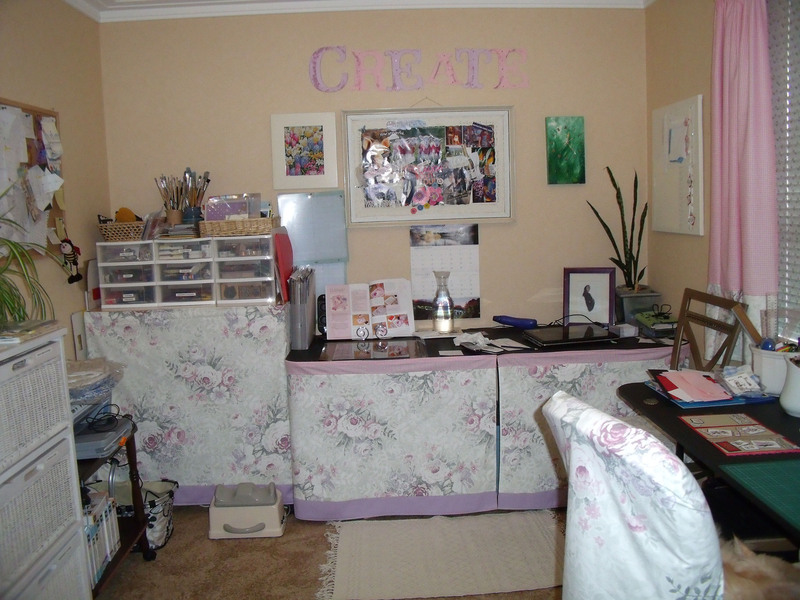 Yes, all we ladies of a certain age should have our very own crafty space – it will inspire you and keep you inspired. And you have so many lovely dolls to make next year, you have to store your yarn and assorted stuff and keep those babies safe from the maws of death [otherwise known as Earl] 🙂 Guests can have a pillow on the floor and will be charmed by the rustic loveliness of your crafty room! Oh dear, did I really correct your spelling mistakes? Like I never make any!! Thank you for all that warmth and love and slobbery kisses and all – I feel quite well loved and ever so slightly wet. Siddy was playing with a border collie pup the same age as him this morning. The fact that she was ten times bigger and kept trying to fit him into her mouth deterred no-one. He came home somewhat wet and ever so slightly slimy and I still haven’t had a chance to shower him off. He keeps climbing into the tub and looking hopeful. It is soooo hot here. I haven’t had heat like this at Christmas since I left the North Island. It is lovely! I’m quite pleased with my garden – it is suffering a bit in this unexpected heat so I just hauled the hose out of storage and rigged it up in a somewhat convoluted manner due to the fact that the outside tap is a mile and a half away and I don’t want prospective visitors tripping over it as they make their way to my door. I am lusting after your dessert! Poor Siddy! Slobbered by border collie kisses ;). Heat? I guess we will get it soon enough, or maybe you got the heat that we got the other day. Enjoy it while you can ;). It certainly does wonders for the garden doesn’t it? Sanctuary is starting to take off :). Sounds like a really good idea Ms Pauline :). I, for one, would love that gorgeous recipe :). I ate coconut ice cream for my dinner last night (2 bowls). It is amazing how indulgent that felt even though it was completely and utterly (almost…) healthy :). I like the sound of your icecream, but don’t know how to make without it going ‘icey’. Do you use a churner or icecream maker of some kind? You wrote this post just for me, didn’t you? Go on…fess up. I LOVE what you’ve done with the place. 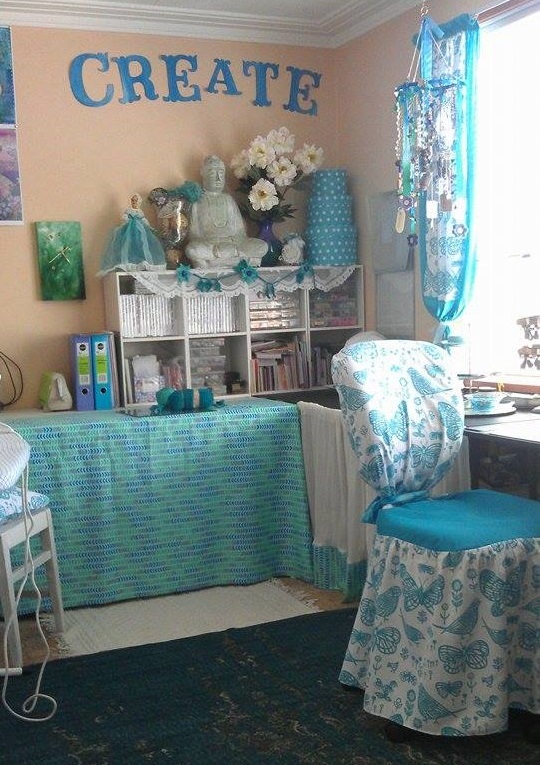 Your crafting room is so much more *you* now with those beautiful shades of blue and the accents of white. It looks like something out of a magazine. It’s delightful looking at all the small touches that add up to an extraordinary space: the three-tiered trays, the rubber stamps, the lace, bunting and original art on the wall. Gorgeous. I’m intrigued by the drapes and the chair dressing. You’ve worked wonders doubling your available fabric. You’ve dressed up your wooden mannequin! She’s delightful and quite fancy with her pearl headpiece and lacy chiffon dress. Isn’t she a dream?! The international dangler looks right at home and I’ll bet does a good job catching the light from your window. Now on to your garden. I know you’ve had unseasonable cold and wet weather, but your garden doesn’t seem to mind. Perhaps the nice shelter it receives from the patio walls makes a difference. Whatever it is, everything is thriving. Look at those plump peas. Oh yum. The bright colored pots add a nice dimension too. You are on a creative roll my dear. I feel like scooping you up into a great big hug…but feel calmer knowing that option will come to be soon. 🙂 It is so amazing – I’m still trying to reconcile the whole thing! I’m still faffing about in the art room, making giant tissue pom-poms now to hang from the ceiling and still trying to complete the flower bunting …… Christmas is getting in the way now. It was a late starter and seems to be gaining in impetus! I love being in the room, so my time should be well spent in there next year. I keep forgetting to write about the fact I’m taking a year long art course which starts on Jan 1st and thus my deadline to get this room sorted and set up. I’ve got my fingers crossed for the tomatoes, several flower bracts but no fruit as yet. Darn that Christmas getting in the way. LOL. I can relate, though. I’m excited to hear more about your class when you get going. What fun! As for your tomatoes, flowers are an excellent start. Wow! I must say, retired life certainly agrees with you, Pauline. Your new space is beautiful! The colors provide such a whimsical feel…I love it! Yes! I wanted to create a room that I would like to spend time in. And I love this space and the colours are just YUM!! I’m planning on spending a lot of time in here next year and now I feel I can. Very lovely, indeed! All that work and the little touches really make it a special place. A wonderful place to dream and create. We are in winter here, the photos of your garden were a real treat. Yes, I vaguely remember the greens of summer. Isn’t it amazing how quickly the seasons change about though – it wasn’t so long ago they were reversed and it won’t be too long before they are again! I love that with blogging we get to share each others climate and season. What a post! You packed so much goodness into this! 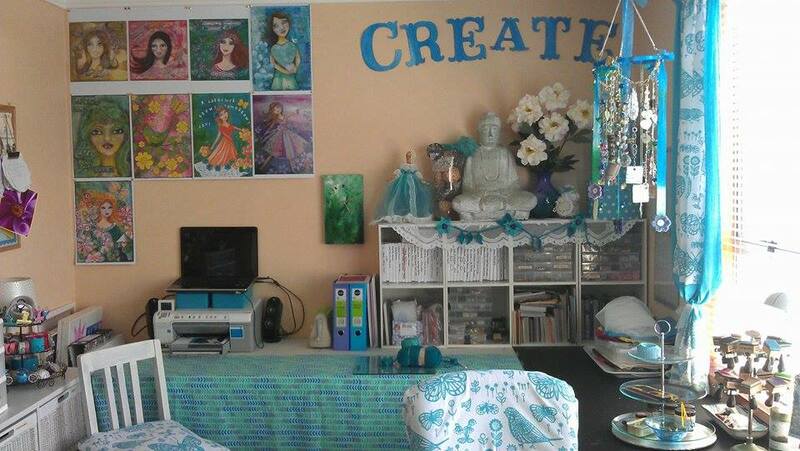 Your room looks wonderful–such a perfect space to celebrate and encourage creativity. 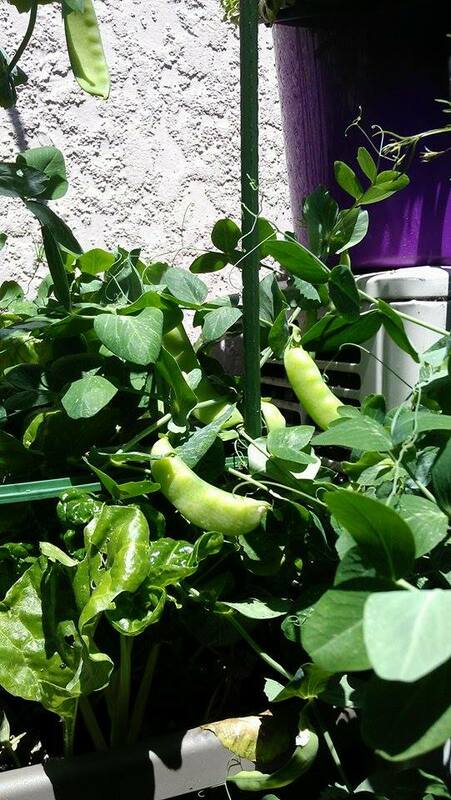 And the garden is succeeding beyond belief–wow! But, really, it was your last paragraph that got to me–just a beautiful reminder that, no matter our differences, we share so much! Hi Kerry! Thank you – so glad you all like my blue room too. I stand in the doorway and smile 🙂 And I think everyone is surprised by the garden, not least me! It seems to have created its own micro-climate and is growing like Topsy – fingers crossed for the tomatoes, I haven’t seen any fruit yet. This is the time of the year when I ponder much on the one thing all humanity shares in common – we are all souls having a human experience. It’s not easy and instead of fighting each other we could instead extend a helping hand and offer empathy. As you say, we share so much! We don’t have Ikea here 😦 I don’t know why – we have everything else! And I would live in an Ikea if I could! Pottery Barn in the States is the same too – I should love to visit one of those! I’m a big fan of your blue room – I love blue. And your garden- truly amazing. What a feast you’ve given us here Pauline! I could practically live in your revamped art room,the colour of course is a splendid choice and it’s so well organized and bright. Seems very spacious too. I’d like to have two work tops to utilize. Mine is always overflowing and I end up on the floor. I have an old wooden drop leaf table in our storage locker I’m considering. Maybe on casters. The ends gate to make it bigger when needed. I also love how your work tables can store behind the covers and still be all tidy. The garden looks like it’s overflowing in every direction. The hit of fuchsia in the pots is fantastic. Sorry to hear your weather’s been ‘poo’, LOL. That must be a quaint New Zealand terminology in use but understood worldwide no doubt. Don’t you just adore Lobelia? Mine will do fantastic one year and rubbish the next. I almost think it prefers shade over sun. Maybe I just overwater it? I tend to do that even though I have a plant gauge. I think, it’s so hot out, it must be thirsty….trust the gauge Boomdee! The letters look super in aqua! Did you shape them yourself? Is ‘Create’ painted right on the wall now? I see my card in your wee Christmas vignette, I love mailing things around the world, heart to heart. Can you believe Dani is making so many buntings? Her poor hands might be permanently stuck in the same position. So you’re making some too? That’s a gorgeous aqua you’re working on. Glad to hear Siddy and Orlando are healthy too. Do you feel like all the planets are aligning and good Karma is surrounding us? Or maybe the Cosmos are smiling and removing obstacles? Whatever it is, I love. I imagine you must get butterflies just thinking about spring, I do too. What a tale we’ll have to tell xoxo Hugs K.
Dani has done such an amazing job with her bunting – and was the first one to inspire me in that direction. I am going to hang stars and flowers from the curtain rail and more sparkly things too. The view is not great and I do everything I can to block out my urban environs. Alright, alright … so there was a sale on blue fabric. 😉 … I couldn’t resist. Very well done … and it’s good to see the what is happening in the southern hemisphere gardens! … after all, the outdoor colors here is gray and browns Bestivus of holiday wishes to you … and my holiday post will be up for your Christmas Eve..
Well you’re not far wrong Frank – I only do fabric at sale time. We sure do have a lot of colour around here – and blue skies too which is most welcome! I shall look forward to meeting up with you on Christmas Eve. Cheers to your winter being gone!